Nebraska USATF. Team Nebraska. Nebraska Run Guru. All the offshoots that have now blossomed on their own. Every single one started by a seed, by a single Sower. You readers understand the importance I place on doing things that others don’t or won’t, haven’t or couldn’t, shouldn’t or wouldn’t. Daring where Angels fear to tread as it were. I don’t know why there was a blank canvas when I moved here in 2001, it just was. A wide open field allowing seeds be sown, competitive running and racing. As a club, as a culture. Not done yet. Bar None Produce no less a singular expression of excellence. Built on a belief in completely chemical free garden vegetables. Like my running programs, a vision that requires extra, above and beyond the status quo. If you really believe in something, and enjoy what you do, there really is nothing better. Principled. Unwavering. And All Started Here. 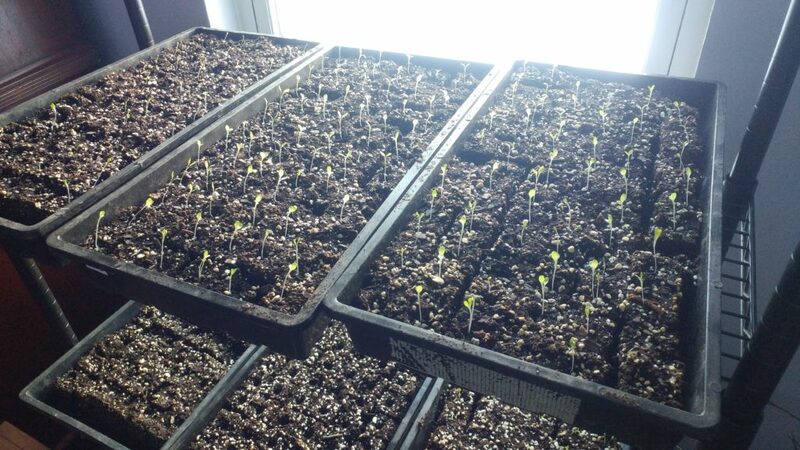 Lettuces and cabbages and leeks and collards all springing up. Each one a single seed that will end up as chemical free nourishment. Excellence In, Excellence Out. Always. This entry was posted in Uncategorized on February 12, 2019 by runguru.